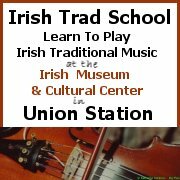 The website of the Wild Clover Band, Nebraska’s top Irish traditional music band, is back working again. They themselves, though, never went away you know. This entry was posted on Wednesday, August 23rd, 2006 at 9:31 am and is filed under Wild Clover Band. You can follow responses via my RSS 2.0 feed. Both comments and pings are currently closed. Since the site has been down we have added some gigs! Logan should be an easier drive for Kansas City folks, though. It’s a great little festival!